The third workshop in the series was held on 21st February, on the Edinglassie Estate, near Huntly, and in the Glass Village Hall. The estate owner, Malcolm Hay, and his gamekeeper, Darren Milne, kindly hosted us. We were once again blessed with very acceptable weather for February and good discussion took place during the afternoon moorland visit, as well as in the village hall. We were back in grouse country and this influenced the discussion, but there was contribution from the Pearls in Peril project, which provided some useful input about the impact of muirburn, by burning or cutting, on water bodies. A key point throughout the discussions was that 'one size does not fit all'. 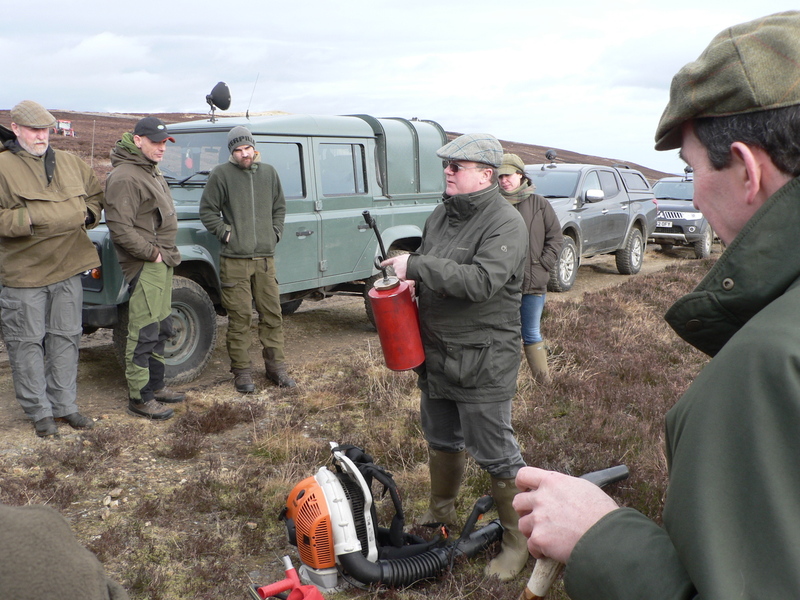 Planning for muirburn needs to be carried for each site. The number of people required for muirburn should be decided by a risk assessment approach. Efforts will need to be made to communicate the message about muirburn to those who might not think of visiting the website. On-the-job training is essential for muirburn. There was a concern that a move towards certification could result in opening the doors to a lot of bureaucracy. If the Code, and the bureaucracy that surrounds it becomes too prescriptive, the result could be an increase in bad practice and uncontrolled fires. The Neighbour Notification procedure is largely ignored. Some form of simple written plan should be prepared. Many estates already have muirburn plans. Duplication should be avoided. There was a mixed reaction to the proposal to produce a Guidance Card, but on balance the concept was supported. If this is produced, it should be in a form that can be downloaded onto a smart phone. The existing Code's statement about fire size (a fire front of 30-50m) should be revised with a view to reflecting the different needs of different parts of the country. The ability to burn in September would be welcomed (a trial to assess the impact of burning in September has been completed and the results are due to be reported in 2017). The final workshop will take place in the Battleby conference centre, near Perth, on 14th March. In addition to seeking the vies of delegates about the draft revised Code, the workshop will consider the feedback from the previous workshops.